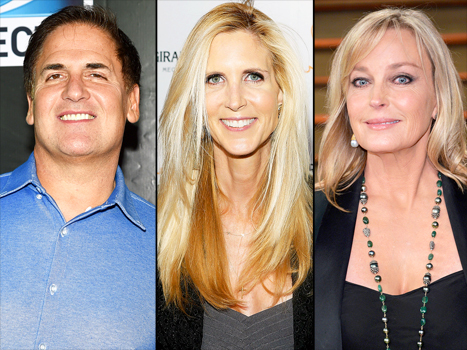 Marc Cuban, Ann Coulter and Bo Derek. A full complement of celebrity hors d’oeuvres will be served up when Syfy airs Sharknado 3 in July. This time the storm sets down in Washington D.C. Plutocrat Marc Cuban of Shark Tank will appear as the President of the United States with conservative pundit Ann Coulter as his Vice-President. Bo Derek plays Tara Reid’s mom, ‘N Sync’s Chris Kirkpatrick is a lifeguard, and notorious TV host Jerry Springer is the edible tourist Mr. White. This entry was posted in Skiffy and tagged Sharknado by Mike Glyer. Bookmark the permalink. People who make movies like this should be forced to watch them, over and over, until they clue in how bad the are.